Miriam Al Jamil has kindly given The Vauxhall Society her 2013 King’s College, London dissertation on how children are portrayed in the art of Vauxhall Gardens and in that of the Foundling Hospital*. Among the many fascinating insights Al Jamil explores is the role of this tiny Vauxhall Gardens copper ‘season ticket’ of 1737 which can be seen in the collection of the Foundling Museum, the art collection that is all that remains of the Coram Fields ‘Hospital’, which took in illegitimate children. The mothers, many illiterate, left behind a ‘token’ – in this case the season ticket –to identify the child should she be able to reclaim him or her. There was to be no happy ending in this case: that’s why the season ticket is still there at the Foundling Museum, as David Coke explains below. And as Miriam Al Jamil points out, for sad stories you did not have to go further than the gates of Vauxhall Gardens and the children who congregated around them. 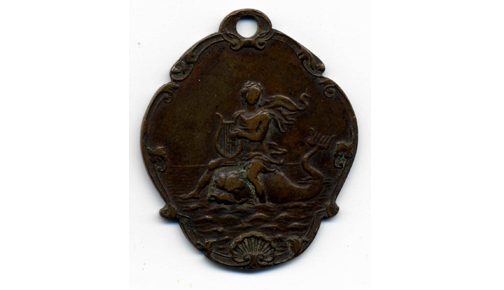 Historian David Coke, co-author of Vauxhall Gardens, A History, explains the significance of the copper token. The tokens (which are all sorts of small objects, usually a piece of dress fabric but in one pathetic case just an empty hazelnut shell) were left with the children by their mothers when they deposited them at the hospital, so that they would have some means whereby they could prove ‘ownership’ if they returned later to reclaim their child. The children’s names were changed as soon as they were registered, so they left their old lives and identities behind. The hospital, of course, had its registration documents, but many of the mothers were illiterate, so needed an identifiable keepsake by which to identify their own child. Often the token was half of something (a small coin, a button, a piece of cheap jewellery), and the mother kept the other half, as proof, and to have something that would remind them of their child, and keep up their hope that one day they might be reunited. Of course, it happened all too rarely that a foundling was actually reclaimed; in the early days, a mother would not only have to show that she could now support the child herself, and that she was fully ‘reformed’, but she also had to pay the hospital back for whatever the child had cost them so far (up to £50 per year in some cases). This condition was later dropped, but it is hardly surprising that few mothers made it to a state where they could reclaim a child. People have drawn romantic conclusions from the fact that one of the Foundling tokens was a Vauxhall Gardens season ticket; however, this particular season ticket was produced in 1737, and the Foundling Hospital didn’t open until a few years later, so the child could not have been the result of a brief liaison in the gardens in 1737. The ticket may just have been something the girl was given by an admirer or that she found in the street, and was possibly her most precious possession. The ticket, now at the Foundling Museum, has the name Richard Arnold Esq. engraved on the back as the original subscriber, but he may not have been the father. Despite extensive research, and because the tokens and documentation have long been separated, it has so far not been possible to trace the original child whose token this was.